Image Size: 19 X 29 in. One part oxygen, two parts hydrogen, and three parts magic. 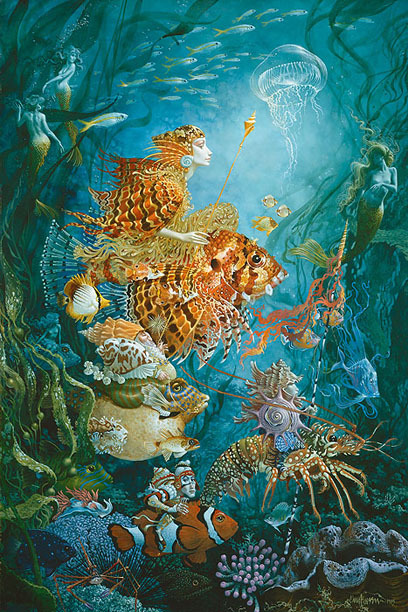 The anatomically correct fish, lobsters and jellyfish make this portrait of a regal queen of the water world and her entourage seem… well… possible! She is adorned with elegant ornaments of the sea and fittingly, rides a lion-fish, a fierce defender of this marine jungle. Below her rides the court exchequer. Mounted on a puffer fish, he wears the smug expression of high authority, despite the fact that some sand dollars have slipped from his belt and stream behind him. A hunchbacked court jester astride a clownfish gives us a knowing look. The procession is led by a well-armored knight bravely carrying his spiny-conch shield and riding his “steed”—a spiny lobster—ready to do battle with any adversary.